Partnerships with corporations and both external and internal educational entities help DELTA succeed with distance education, instructional services, technology development and marketing. These collaborations also enable DELTA to work with affiliates in the community to identify and solve learning issues. DELTA staff members are eager to visit your college, department or unit to talk about how we can assist you with learning technologies or distance education needs. In meeting with your group we will share information about our services and learn about your needs in learning technologies and online or blended learning. 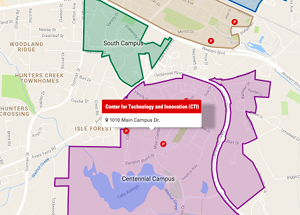 OIT works with NC State colleges and departments to provide IT infrastructure, services and expertise that enables students, faculty and staff to advance NC State’s mission. The Office of Faculty Development facilitates teaching excellence at NC State by promoting faculty growth and development in the form of teaching information, workshops, and support. Library facilities include two main libraries—the D.H. Hill Library and the James B. Hunt Jr. Library—as well as the Harrye B. Lyons Design Library, the Natural Resources Library and the William Rand Kenan Jr. Library of Veterinary Medicine, with a total of more than 2.3 million user visits per year. The Libraries’ collections contain more than 5.1 million volumes, and approximately 91,000 print and electronic serial subscriptions. The Disability Services Office provides services or accommodations that allow persons with documented disabilities and medical conditions to fully participate in NC State’s academic and work environment. This roundtable provides faculty, staff and students with the ability to discuss teaching and learning with technology (and associated policies) at a broad level across the university. At times, the TLTR provides recommendations to University administrators about issues related to educational technologies. The bookstores provide textbooks, school supplies, computer hardware and software, and distributes distance education media to students. Registration and Records provides information for students, faculty, and staff about courses, curricula, teaching, and scheduling of classroom facilities. Outreach and Engagement supports outreach programs and services so that North Carolina can continue to thrive and grow by using the knowledge available at NC State. The McKimmon Center for Extension and Continuing Education encompasses a wide array of learning opportunities, professional meeting facilities, and University services. The Shelton Leadership Center outreach programs focus on leadership development within corporate, governmental, educational, non-profit and youth development organizations. Through the EI, individual entrepreneurial projects and programs throughout the university unite to provide students with top-tier resources and opportunities. The Entrepreneurship Initiative (EI) at NC State encourages multi-disciplinary participation on every level – faculty, staff, industry and outreach partners, and most importantly, students. This nonprofit provides high-speed internet, video, audio, and data center services to universities and other institutions across the state. MCNC hosts servers supporting NC State’s learning management systems. The North Carolina Research and Education Network (NCREN) provides MCU, gatekeeper, H.323 and bridging services for distance education teleclassroom activities. The NCIH is a dedicated statewide network providing data and videoconferencing services. Video applications which are supported over the network include distance learning for K-12 and higher education, state agency meetings, statewide training activities, emergency response assistance, and public hearings. The RTC encourages the development of new, innovative cable television and telecommunications systems by franchise applicants seeking to do business within Raleigh and also serve the public interest.